America AF Beer - White (Ladies) - Club AAF Exclusive Design has a rating of 5.0 stars based on 3 reviews. Don't Forget Free Shipping! Enter promo code CLUBSHIPPING at checkout while logged into your account. No matter your feelings about the 2016 election, we all could use a little more love in our life. Bring back that loving feeling and start campaigning for Maverick and Goose in 2020. Get the t-shirt showing Donald posing with his Christmas gift from First Lady, Melania. Grab that President Trump! Bike? What bike? That's my bike, punk! For some it may be a day of rest. For others, it's the day we showoff our fantasy coaching skills. For people like us though, it will always be known as "Sunday Gunday". You know what I mean? I'm not drunk, I'm American. This is how we celebrate Independence Day in the U.S. of A! Drinkin' beer and kicking @ss! Do you think America’s Founding Fathers were worried about people’s feelings when they wrote the Constitution? No, they were too busy polishing their muskets and fine-tuning the 2nd Amendment. Be like the Founding Fathers. 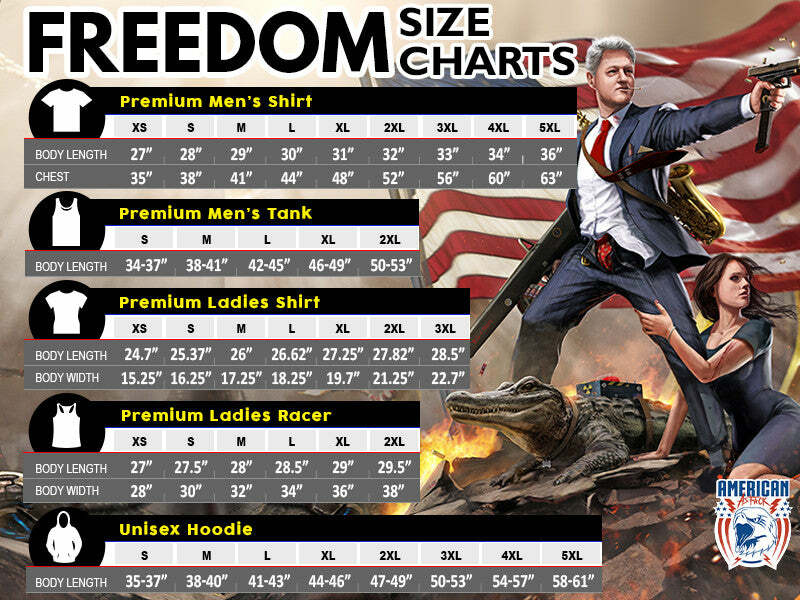 Assert your Freedom with your tshirt. Ahhh...The good old days. Economy was great, future looked bright, and we just pointed our nukes at anyone who threatened us. Show your love for America's favorite patriotic pastime this summer. Beer pong proves that sports and alcohol DO mix. You sink it, they drink it! We're all about LGBT pride here in America... You can't go wrong with Liberty, Guns, Beer and Trump! Giving snowflakes free tours of the Pit of Misery since 2016. Our home colors might be red, white and blue, but our away colors are definitely something you don't want coming for you. The perfect message for the trendy college hipster in your life. Looks like capitalism wins again, dou-CHE-bag. If you're planning on getting Donald Drunk this Saint Patrick's Day at least do it in style! The MAGA duo that made the entire snowflake underground have a complete meltdown. Kanye is the ying to Trump's yang.